As a resident of Phoenix, you appreciate that the weather is pleasant most of the year. We have heat, but that is not something which cages people indoors like snow or bitter cold. And more than 300 days of sun each year makes outdoor activities common for many people. But what is not common knowledge is that there are many scientifically proven benefits to being outdoors. Improved short term memory- A study at the University of Michigan found that test subjects scored 20% better on a short term memory test after a short walk among trees. Another similar study found that depressed subjects had increased working memory after a short walk in a natural setting. According to the Journal of Environmental Psychology, natural beauty can elicit feeling of awe which boosts mental energy. Studies have found that exposing your mind to a restorative environment such as being outside in nature, will increase your mental energy. If you are looking for a way to lower your heart rate and reduce your levels of cortisol, the hormone which is a marker for stress, then you need to spend some time around trees and nature. This information has been reported by multiple sources including the Scandinavian Journal of Forest Research, Environmental Health and Preventative Medicine and Biomedical and Environmental Sciences. If you want to protect your children’s vision you should encourage them to play outdoors. An Australian study of 2000 schoolchildren found that the more time the children spent outdoors the lower their chances of developing myopia or nearsightedness. A group in Taiwan conducted a similar study and found that outdoor play reduced the potential for myopia by nearly 10% in just a single year. These amazing benefits were reported in Ophthalmology in both 2012 and 2013. Technology, busy lifestyle and both work and personal commitments can make it very difficult to make time to be outdoors. But there is a very simple solution which can provide much needed outdoor time for your entire family. 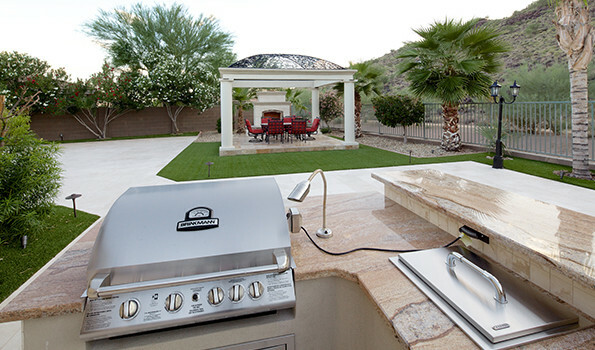 Contact UNIQUE Landscapes today to speak with a professional designer about creating your outdoor living space. This is not simply a few chairs on a covered patio but a full outdoor area which will include an outdoor kitchen and dining area as well as complete outdoor “rooms” for entertaining, relaxing and enjoying time with your family. Taking time to reconnect as a family at mealtime is very important, so why not include additional health benefits and spend that time outdoors?